A group of eminent food and travel writers have experienced a road-trip with a difference meeting Welsh food and drink producers and hearing their stories. The London based group enjoyed the flavours, smells, sights and sounds of some of Wales best known produce, set among some stunning scenery. It was part of the Welsh Government’s drive to increase awareness of the European Union’s PFN scheme and to promote Welsh food and drink to a wider UK audience, the two-day trip took them from the Brecon Beacons in the south to Anglesey in the north. The Welsh Government provides help for Welsh producers with applications by funding support, which is delivered by ADAS UK Ltd. Successful applicants will receive Europe-wide legal protection against imitation and misuse. Famous members of the exclusive ‘club’ include Champagne, Parma Ham and Melton Mowbray Pork Pies. The first Welsh product to gain PFN protection was Welsh Beef, which was awarded Protected Geographical Indication (PGI) status 13 years ago and was followed a year later by Welsh Lamb. Currently there are a number of Welsh products at various stages in the application process. We are optimistic there will be good news through the year as applicants from Wales learn that their endeavors have been successful. . Among them is Traditional Welsh Caerphilly/Traditional Welsh Caerffili cheese, and Traditionally Reared Pedigree Welsh Pork – whose application is being championed by The Pedigree Welsh Pig Society. Both products have gone past the National Consultation stage. Meanwhile seven products are in the European Union’s submission stage – the final part of the application process: Carmarthen Ham, Welsh Laverbread, West Wales Coracle Caught Salmon, West Wales Coracle Caught Sewin, Traditional Welsh Cider, Traditional Welsh Perry and Conwy Mussels. A further 6 – 7 products are in the preliminary stages, just beginning their PFN application journey. “The fact there are so many applications in the pipeline is great news for the Welsh food and drink industry,” says Fay Francis, Consultant with ADAS UK Ltd, who helps producers with their applications. “Producers are really embracing the opportunity to protect and promote their products by utilising their geographical and historical attributes. Said Fay, “The writers tour was a great way of showing Wales at its best. The tour started at the Welsh Whisky Company’s Penderyn Distillery in the foothills of the Brecon Beacons National Park, and which is investigating the possibility of applying for Welsh Whisky Geographical Indication. Next stop was Pembrokeshire, where they sampled a range of Welsh food and drink at the Druidstone Hotel in Wolfscastle, before learning more about the iconic Pembrokeshire Early Potato – which was awarded PGI status in December 2013. Accompanied by Steve Mathias, agronomist for farmer-owned vegetable brand ‘Blas y Tir’, the group had the opportunity to get their ‘hands dirty’ and pick their own Pembrokeshire Earlies, which were then served at their evening meal. The first day was rounded off at The Harbourmaster Hotel in Aberaeron with a specially created Welsh PFN menu including PGI Welsh Beef, Pembrokeshire Earlies (PGI) and Anglesey Sea Salt Halen Môn PDO (Protected Designation of Origin) Salted Caramel Chocolate Tart. For the final day they headed to the award winning Rhug Estate for a tour with the organic farm’s owner Lord Newborough and a lunch profiling PGI Welsh Lamb. The tour ended in Anglesey and a visit to The Anglesey Sea Salt Company Ltd whose Halen Môn range of sea salt was awarded Protected Designation of Origin (PDO) status in early 2014. 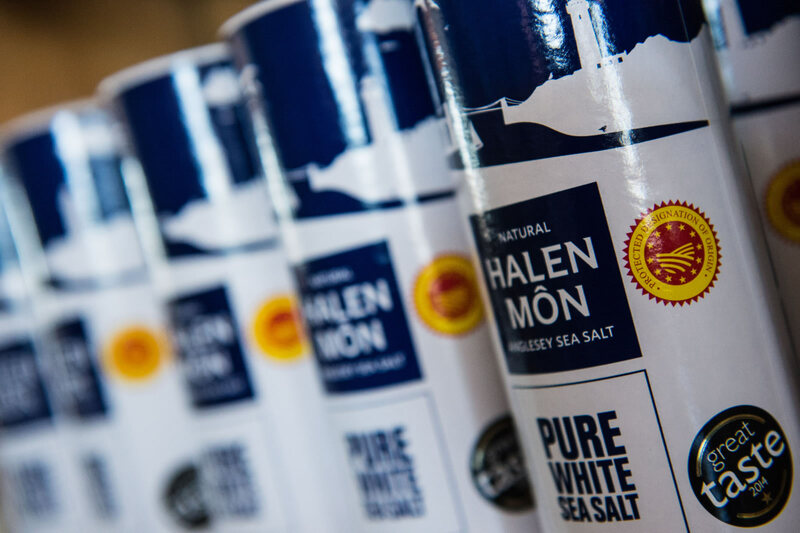 There they learned about the process of converting water from the Menai Strait into award-winning Halen Môn salt and saw the company’s newly opened Salt Cote. Rolled out in Europe in 1993, there are three PFN designations: Protected Designation of Origin (PDO), Protected Geographical Indication (PGI), and Traditional Speciality Guaranteed (TSG) status, each with their own particular requirements and embracing a wide product range. To achieve PDO status all aspects of production – including the sourcing of raw materials – must take place in a specific geographical area. While for PGI status some elements of production or sourcing of the raw materials and ingredients can take place outside the geographical area. The product can be produced or processed or prepared in a specific area. For a product to be awarded TSG status it has to be made to a traditional recipe or production method, but does not need to be linked to a specific area. Anglesey Sea Salt / Halen Môn (PDO) on display at the company’s new Salt Cote near Brynsiencyn.